How to transfer video from iPhone to MacBook/iMac? This article introduces the top 6 ways to import video from iPhone (XS/XS Max/XR/X/8/7/6s/6 etc.) to Mac computer for free storage saving, backup, posting online, editing or other uses. Video shots and movies, especially 4K UHD content, can easily occupy an iPhone, even 512GB iPhone XS. A minute of 4K video at 60fps	is approximately 400MB, and the average size of a 4K Ultra HD movie is about 100GB. Running short of storage continues to be a thorny problem for iPhone users particularly for those who have iPhones with less memory. What springs to your mind first may be deleting videos or photos. 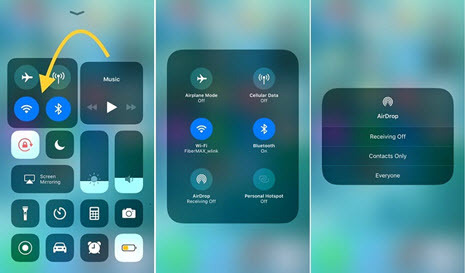 But there're better ways to free up your iPhone storage space that don't necessarily involving deleting your precious memories, such as transferring video from iPhone (XS/XS Max/XR) to Mac. In this tutorial, you will learn how to move video from iPhone (iOS 12) to Mac (macOS Mojave) with 6 simply methods - no iTunes errors! Let's check them one by one below. 1-click to batch sync video, movie, iTunes protected videos from iPhone to Mac. Convert iTunes protected movies/TV shows/music to DRM-free MP4 format. Manage, resize, transcode, and rotate videos for iPhone. Support the latest iOS 12 and macOS Mojave. Sync music, photos, ringtones, eBooks, audiobooks, etc. between iPhone and Mac. 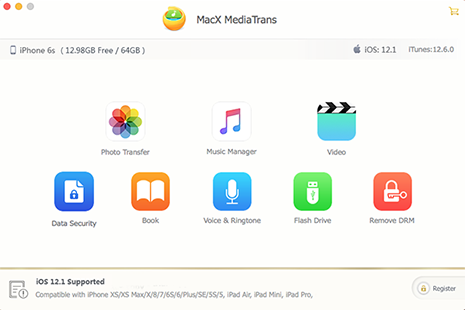 Follow guide below to use MacX MediaTrans to easily and quickly transfer iPhone videos, slow-mo, time-lapse recordings, movies, TV shows, music videos, etc. to Mac without iTunes syncing. Download and launch this iPhone video manager for Mac. It supports macOS Mojave/macOS High Sierra/Sierra/El Capitan and earlier. Step 1: Connect your iPhone to the computer with a USB cable and then disable iTunes Auto Sync by following the instructions on the prompted window. Note: Turning off iTunes sync is optional, but we strongly suggest you to do it in order to keep your iPhone data from getting erased. Step 2: Click on the "Video" button on the main interface to open the Video window. Step 3: On the left side of the Video window, you should see all the video content on your iPhone, covering Video Recorded, TV Shows, Movies, Music Video, etc. Click the type of video, and select video files you want to transfer from iPhone to Mac from the list. Step 4: Click the "Export" button at the top menu bar. Then the videos will be transferred from iDevice to your Mac computer in a flash. After you transfer the 4K/HD videos from iPhone to Mac, you may add new contents to mobiles by click Add Video button. When you import videos to iPhone from Mac computer, this software will automatically convert incomptible files into iPhone supported formats, resolutions, sizes and orientation. In addition to the function to copy photos from iPhone to Mac, iPhoto also provides an easy way to transfer videos from iPhone iPad to Mac (MacBook Air/Pro, iMac etc). It supports videos transfer from iPhone camera roll to Mac. It is a built-in app, so that no extra software is required. Besides, iPhoto supports most common video file formats. 1. Connect iPhone to Mac computer via USB cable. 2. Open "iPhoto" and find your iPhone under Devices. 3. Now you can see the photos and videos on your iPhone. Click "Import Photos" to transfer all videos, or click "Import Selected" to transfer the selected videos from iPhone (XS/XS Max/XR) to Mac. 4. Switch to "Last Import" and click "Edit". Select All and click Edit. 5. Now click "Copy" and copy all the videos imported from iPhone. Go "Finder" and click "Edit". 6. Simply press "Paste" and videos are imported to Mac. Like iPhoto, many built-in apps on Mac can move videos from iPhone iPad to Mac without iTunes. If you have installed Image Capture, you have a fast and easy way to transfer iPhone video shot to computer. 1. Connect iPhone to Mac via USB cable and launch Image Capture. Now you can see a list of the photos and videos in your iPhone camera roll. 2. Select the videos you'd like to move to Mac and then click "Import". You can transfer multiple videos with Command key. To import all videos from iPhone to Mac, simply click "Import All" button. 3. Now a window will pop up specifying the folder on Mac to save the iPhone videos. You can select the destination. Then click "Import“ and the selected videos will be transferred. This method is often ignored by most users: iMovie. While it is well known as a video editing tool, it also features the ability to import videos from iPhone to Mac without iTunes. With iMovie, you can achieve this in a few clicks. 1. Connect iPhone to Mac computer via cable. Open iMovie app on Mac. 2. Click "File" and select "Import from Camera". Then your iPhone will be detected. 3. Select the videos you'd like to import to Mac from the list. 4. Click "File" and then "New Project". Drag and drop the videos and click "Share". 5. Click "Export Movies" and the videos will be moved from iPhone to Mac now. The last method is to send the video to your email account and download them to computer. This method applies to videos in small size. If you want to transfer a movie from iPhone iPad to Mac, or 4k videos from iPhone to Mac this way, it will take a lot of time. If you don't have a large-size video on iPhone to transfer to Mac without cable, sending an short video message via Apple Email app is also a way to go. This is the easiest way to import videos from iPhone to Mac. The biggest problem using email has strict size limit, which HD videos can easily cross. In other words, this method is not suitable for HD/4K video transfer. Besides, some Email apps may have requirements on the file format. Apple's AirDrop offers a faster and easier way to copy iPhone video files to Mac wirelessly without cable than sharing via email. And large 4K UHD videos or longer videos can be sent too. Use steps below to give it a shot. 1. Find where the video you'd like to share to Mac locate, and open it. You can tap Select and choose multiple video files on iPhone to transfer. 2. Tap the Share icon. After a few seconds, you should see the Mac computer icon, just tap on that icon. 3. The transferred video from iPhone will download to the Downloads folder. 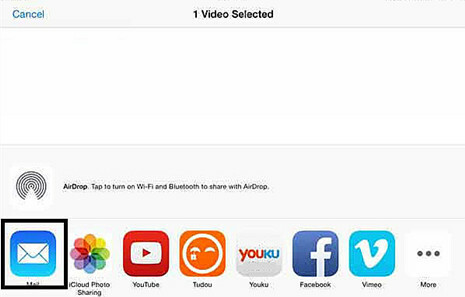 Tips: before you AirDrop videos from iPhone to Mac wirelessly, make sure the Wi-Fi and Bluetooth are enabled. Your Mac is required to use OS X Yosemite or later, and iPhone iOS 7 or later. Sometimes, AirDrop not working on iOS 12/11/10 issue is quite annoying. Support any video format; Support iTunes DRM files. 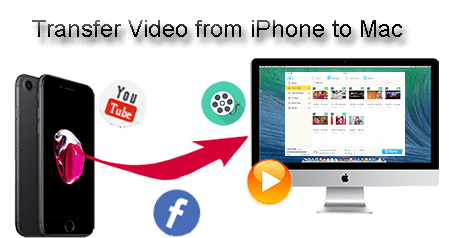 Best iPhone video to Mac transfer software will fast transfer data from iPhone iPad to Mac/PC, including photos, videos and music and vice versa, without iTunes. 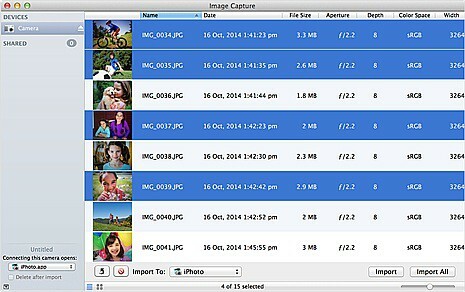 One-click solution to transfer photos from iPhone to Mac. Best iTunes alternative to perfectly manage iDevices. An Easier-than-iTunes Method to backup iPhone data. Free up tons of storage on iPhone easily.